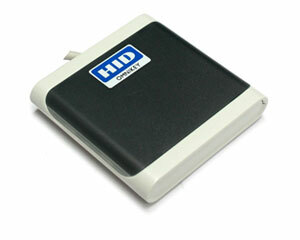 The Omnikey 5025 CL from HID is a 125 KHz USB contactless smartcard reader that supports low frequency physical access control cards such as HID Prox. The reader supports PC, thin and zero client environments, providing full CCID support. Compatible with Windows, Linux and Mac operating systems, this reader supports Tap-and-go use as well as permanent 'card present' operation. Backwards compatible with the 5325 CL, the Omnikey 5025 CL comes in a modern, pocket-size housing that enables seamless integration into various corporate environments. The Omnikey 5025 CL features a compact and elegant design, as well as an optional desk/wall mount on the back.